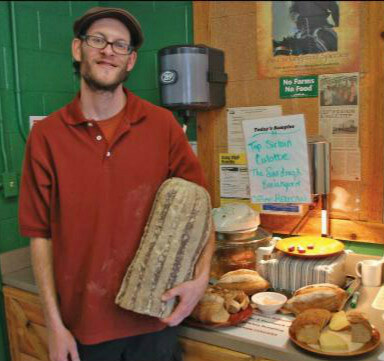 Local Baker Shawn Saunders was in the store recently to sample a wide selection of his Sourdough Boulangerie breads, which include caraway-scented Jewish rye, sweet potato brioche and bacon-cheddar whole wheat. Drawing inspiration from Peter Reinhart, one of the great masters of the dough craft, Shawn’s been perfecting the art of bread for more than 20 year’s and says, “I’ve done my homework.” He uses only unbleached flours from the former Rocky Mountain Milling at Platteville (now Bay State Milling) along with other high-quality ingredients. For example, his pumpernickel rye contains molasses, coffee, and black onyx coacoa powder from the Savory Spice Shop, which gives each loaf its dark hue (rather than the more common artificial food coloring.) Most of his loaves sell for $5 or less.